In what will be a busy end to 2018 in terms of British boxing, another world title fight has been announced. Josh Warrington is to defend his IBF world featherweight title against Northern Ireland’s Carl Frampton at the Manchester Arena on 22nd December. The match up comes as no surprise given Warrington was ringside for Frampton’s last fight against Luke Jackson in Belfast in August, he then entered the ring and both fughtrrd said how much they wanted the fight, so an easy fight to be made considering both are promoted by Frank Warren. This is without doubt Warrington’s toughest test yet, as he faces a former two weight world champion in Frampton. Frampton held the featherweight and super bantamweight straps. Warrington won the IBF featherweight title when he defeated the then champion Lee Selby in May. Winning by split decision (113-115, 116-112, 115-113) to send his home support at former English football giants Leeds United’s Elland Road Stadium. “The Frampton fight really appeals to me and it will be another big scalp for me.” Said the IBF featherweight champion in a press release issued by promoter Frank Warren. I went over to Windsor Park to watch Carl fight a few weeks ago, I wouldn’t have gone over there if I wasn’t interested in the fight. There was easier routes I could have taken like having a voluntary. Frampton and Selby in the same year would be a massive achievement. “It’s about keeping the momentum going and I just believe I can beat Carl. I am just as confident in beating Carl as I was beating Lee (Selby). These are fights that the British public want to see, I’m a world champion and when you are world champion you want to fight the best and Carl is a name who is up there. Frampton’s last fight was no where near as close as he put in a masterful display against Australian Luke Jackson by TKO in the 9th round having dominated from the start, in a bout that was also held at a football stadium, Windsor Park in Belfast. It’s clear Frampton has faced a higher level of opponent, Leo Santa Cruz twice, Nonito Donaire and Scott Quigg however Warrington has shown he can be a dangerous fighter after his display against Lee Selby. 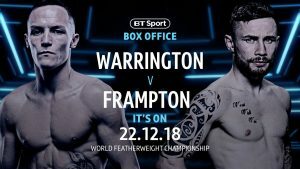 “Me and Warrington have big fan bases that make a lot of noise, so I think first and foremost the atmosphere is going to be fantastic and possibly a bit hostile as well.” Said Frampton. Both men will have large support in the Manchester Arena, with Frampton’s green and white army ready to travel all over and Leeds only an hour away from Manchester, the atmosphere should be electric in what may be the best UK domestic fight of the year.